Discount Quintero Cigars cigars store have the lowest online prices on cheap cigar. The Quintero cigars factory was founded during the 1920s by Augustin Quintero and his brothers in their hometown of Cienfuegos, near the Remedios growing region. 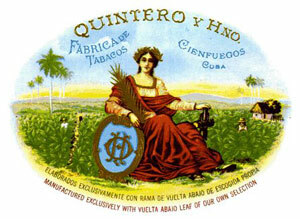 Quintero is one of the few Cuban brands not originally from Havana. In 1940, brothers developed this full-flavored brand. Today it is produced primarily in machine-bunched/hand-finished and all machine-made sizes. Some models are machine-made and appear in the same sizes as the handmade range. These cigars are made from a light-flavored blend of Vuelta Abajo tobacco. The Quintero cigars are quite mild compared to other Havanas. The Quintero Churchill is actually a classic Lonsdale or Cervantes, to use the Cuban factory name. Quintero became a major export brand and became very popular with Spanish cigar lovers, after the factory was moved to Havana in 1940.